0% NICKEL! Earrings developed in consultation with skin specialists that guarantee comfort all day. A Swarovski Crystal set in Skin Friendly Medical Plastic. The 4mm measurement is of the entire setting. Blomdahl earrings are sold by the pair with backs and come in a Clean Pack. In the transparent Clean Pack bubble, one pair of earrings are hygienically packed. The label is a seal which guarantees that you are the first person to wear your new earrings. *Important: Do not clean medical plastic earrings with alcohol or peroxide. It can turn them yellow and brittle. Use a gentle soap and water for cleaning. Nickel is a skin irritant that is commonly found in jewelry. The earring that you’re wearing most probably contains nickel; and if you’ve been experiencing some skin irritation, chances are that you’re allergic to metal. Metal jewelry constitutes a major portion of cosmetic jewelry manufactured today and unfortunately, not many people can wear metal jewelry. Does that mean you need to keep away from cosmetic jewelry? Thankfully, no. At ​Blomdahl​ ​USA​, we are a hypoallergenic earrings and​ ​jewelry​ ​company and we have developed skin-friendly, metal-free jewelry. 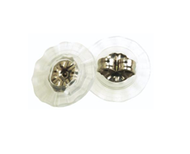 We specialize in the manufacture and sale of medical​ ​plastic​ ​earrings. We understand that nickel is the reason why many people are unable to experience the joys of wearing cosmetic jewelry, unless they’ve found nickel free earrings they truly adore. All of our products are produced using skin-friendly plastic which will protect your sensitive skin from developing rashes and irritation. Our medical​ ​plastic​ ​earrings are set with beautiful Swarovski crystals. Our selection of colorful hypoallergenic crystal earrings is unparalleled. With a variety of cuts and designs to choose from, you are sure to be spoilt for choices. All of our earrings come in sizes of 4mm, making them petite and elegant. The earrings come in pairs with backs. They are placed in a transparent clean pack bubble, keeping them sparkling and hygienic. The labels we use double as seals for the packs and they are proof of the products’ quality. With these medical​ ​plastic​ ​earrings in your jewelry cabinet, you’ll be set to stun and dazzle. Our hypoallergenic jewelry are easy to care for. However, do bear in mind not to clean the earrings with either alcohol or peroxide, as they can discolor your jewelry and make them brittle. A gentle soap and clean water are enough to keep your new medical​ ​plastic​ ​earrings sparkling. Sometimes, an allergy develops due to the skin’s prolonged contact with a particular substance; in this case, metal jewelry. Symptoms include flaky and leathery skin, rashes, blisters, severe itching, and skin dryness. In extreme cases, there may be hives, fissures, and bleeding. A skin inflammation, atopic dermatitis occurs as an allergic reaction to anything from dust to metal. The skin inflames, reddens, and becomes tender. There are dryness and itching as well. A skin infection may develop if untreated. A type of dermatitis that causes scaly skin with bumps and inflammations. Corticosteroid cream and antihistamines are often recommended to treat eczema and other types of metal allergy-related dermatitis. Skin falls off in flakes and this results in dryness and itching. Usually, this occurs only in the area where the skin touches the metal jewelry. Skin discoloration is common. The skin inflames and develops red lumps as a result of contact with an irritant. In some cases, lesions may develop on the skin and may stay for a long period. Erythema leaves bruises behind, making the skin look patchy and unattractive. Constant contact with metal can lead to the development of extreme itchiness. The skin becomes dry and is constantly irritated. When scratched, it results in bruising. Blisters form on the skin due to constant contact with an irritant. These blisters are filled with pus and water and are extremely painful. They are very tender and may burst with the slightest stimuli, resulting in infection. A highly infectious bacterial skin infection which is a result of extreme exposure of the skin to an allergen, impetigo causes rashes and sores on the affected area. The sores grow in size and circumference as the infection spreads and sometimes ruptures when extremely tender, resulting in bleeding and collection of pus. Medical​ ​plastic​ ​jewelry offers lots of benefits to anyone who uses them. But before we get to what these benefits are, let’s look at who should use hypoallergenic jewelry. Well, anyone who experiences skin irritation or soreness after using metal jewelry must consider medical​ ​plastic jewelry. Apart from them, absolutely anyone who wants an alternative to metal jewelry can use hypoallergenic jewelry. In fact, dermatologists recommend using medical​ ​plastic jewelry for daily use in order to reduce the likelihood of developing skin allergies. So why should people use hypoallergenic jewelry? Given the number of skin allergies that can develop by using metal jewelry, it is clear that hypoallergenic jewelry is the way to go. Choose Blomdahl​ ​USA as your number one choice of medical​ ​plastic​ ​earrings.